A 66-year-old white woman reported a one-year history of chest tightness and dyspnea on exertion. She denied any other symptoms. Initial echocardiogram showed a dilated aortic root measuring up to 50 mm and a slightly dilated proximal aorta measuring up to 39 mm. Mild aortic regurgitation also was seen. The aortic valve appeared structurally normal. Coronary CT angiography was recommended. Retrospective, dose-modulated, ECG-gated CT acquisition of the chest was obtained and demonstrated aneurysmal dilatation of the noncoronary cusp of the sinuses of Valsalva (Figure A). The cusp measured 1.5 cm in anteroposterior length and 1.8 cm in craniocaudal length (Figure B). There was associated mass effect on the adjacent left atrium. The sinuses of Valsalva measured 5.3 cm at the widest portion of the aortic root (Figure C). At the level of the main pulmonary artery bifurcation, the ascending and descending thoracic aorta measured 3.7 cm and 2.6 cm, respectively. • ECG-gated CT imaging plays an important role in evaluating suspected Valsalva sinus aneurysms, which are rare (estimated prevalence of 0.14%) and can either be congenital or acquired. • Congenital aneurysms result from localized weakness or deficiency of the elastic lamina. Infectious diseases (eg, bacterial endocarditis, syphilis, tuberculosis), degenerative conditions (eg, atherosclerosis, cystic medial necrosis), and injury from deceleration trauma cause acquired aneurysms. 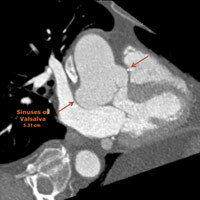 • Aortic regurgitation is a common complication of Valsalva sinus aneurysms and occurs in 30% to 50% of patients. Nonruptured Valsalva sinus aneurysms also may lead to impaired function of the tricuspid or mitral valve, depending on the cardiac chamber into which the aneurysm extends and the proximity of the aneurysm to the valve. • Angiography is considered the gold standard for confirming the presence of a Valsalva sinus aneurysm. However, most cases initially are imaged and diagnosed using Doppler echocardiography. A review of more than 170 cases of Valsalva sinus aneurysms showed that upwards of 90% of cases were diagnosed by echocardiography, 60% by angiography, 20% by CT, and 10% by MR. In the majority of cases, CT was performed to confirm echocardiographic findings. • MR is particularly useful for evaluating the left ventricular hemodynamic pattern, any aortic regurgitation, and the quantification of shunts/flow. However, MR is limited by the time needed for acquisition and, particularly in the setting of acute rupture, CT imaging is preferred. • As seen in Table 1, the upper limit of normal for the sinuses of Valsalva ranges from 3.6 to 4 cm. In our case, the patient’s sinuses of Valsalva measured up to 5.3 cm in the axial plane. • It is important to note that the planes of measurements at CT vary depending on the location of the aneurysm as well as the demands of the planed procedure and cardiothoracic surgeon preference. — Electra V. Kaloudis, MD, MPH, is the section head for thoracic imaging and an assistant professor of radiology at the University of Connecticut Health Center. — Pardeep Athwal, MD, is a radiology resident at the University of Connecticut Health Center. — Alex Merkulov, MD, is the section head for women’s imaging and an assistant professor of radiology at the University of Connecticut Health Center. Bricker AO, Avutu B, Mohammed TL, et al. 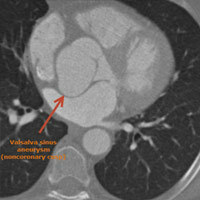 Valsalva sinus aneurysms: findings at CT and MR imaging. Radiographics. 2010;30(1):99-100.
de Heer LM, Budde RP, Mali WP, de Vos AM, van Herwerden LA, Kluin J. Aortic root dimension changes during systole and diastole: evaluation with ECG-gated multidetector row computed tomography. Int J Cardiovasc Imaging. 2011;27(8):1195-1204. Hoey ET, Kanagasingam A, Sivananthan MU. 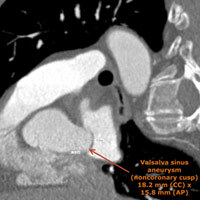 Sinus of Valsalva aneurysms: assessment with cardiovascular MRI. AJR Am J Roentgenol. 2010;194(6):495-504.